In order to better prepare yourself for your appointment with an advisor during Orientation, we recommend you review your academic information and take a look at the schedule of classes. Below are many helpful resources and links. Just click the links and images to access them! Take a look at the Undergraduate Catalog and Schedule of Classes for course offerings. Begin identifying courses of interest. You will have an opportunity to discuss your options further with your Advisor at Orientation. 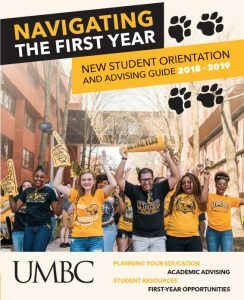 The full-text Undergraduate Catalog can be accessed at catalog.umbc.edu. The Schedule of Classes is available through my.umbc.edu/topics/classes-and-grades.